Beautiful farmland between Sacramento Executive Airport and Yolo County Airport. “So when are you going on your cross country?” my instructor Stan asked after he deemed me competent to handle cross-wind landings. Again and again, he asked. “You’re ready,” he kept telling me. “Soon,” I would reply, reminding him that it had been six months since I flew by myself and that maybe I should practice some local soloing before flying into the wild blue yonder all by my lonesome. But really, I was stalling. Weeks passed. We had a handful more lessons and repeated the above exchange a few times before I got up my nerve to actually practice solo. 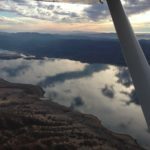 I planned to fly to a local training field–Yolo County, where I completed my very first solo flight almost exactly a year ago. I figured I would practice a few times by myself at Yolo and then maybe Franklin Field, before working up to the short cross country flight which would involve traveling to two destinations each more than 50 nautical miles apart, one with a towered airport. But Stan had other ideas for my first venture out. He suggested that I fly to Yolo (DWA) then to Franklin (F72) then to Rio Linda (L36), with a stop at home (KSAC) in between if I felt like it. All on the same day! The plan would have me criss-country around town, practicing entering patterns, judging wind directions, navigating around airspace. All by myself. I wanted to say no and stick to my boring short plan, but I took Stan’s suggestions as a challenge. Flying the Cessna 182 solo and having a ball. 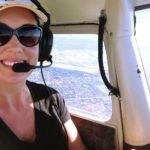 I expected to be buzzing with nerves, but once I got cranking–armed with a paper chart, loosely written flight plan and ipad for back up–I felt more excited than nervous. In fact, instead of stopping briefly at my flight destinations, I visited for awhile, completing three patterns at Yolo, Franklin and Executive before looping around to Rio Linda for a single stop and go. Although the skies were fairly quiet on a mid-week morning, I learned a bunch. At Yolo, I enjoyed a nice rhythm with a couple other student pilots as we shared the field, each practicing touch-and-gos, copiously calling out our respective positions and maintaining good spacing in student pilot solidarity. At Franklin, I managed a small gusty crosswind and actually found myself having fun as I compensated for the winds that kept trying to blow me off course. And on the way home, I appreciated the skill of our local air traffic control folks as they managed eight closely arriving aircraft and I had to make space by performing a 360 turn near downtown Sacramento (too cool!). All of my destinations were either close to another airport or nearby controlled airspace which meant I had to be careful about maintaining altitude limits during some parts of the flight and staying on course so as not to veer unsafely into airspace without permission. But besides pattern work, communication, and (lovely, if I do say so myself) landings, I felt ecstatic to have navigated successfully. Although I’m familiar with the local area by now, the airports never fail to hide from me and I’ve been perpetually nervous about losing my way and completely embarrassing myself. Being able to correlate my position with ground references and easily identify landmarks and airports did a lot for building up my solo flying confidence. Leaving Franklin Field with Elk Grove to the right, and heading for Sacramento Executive. 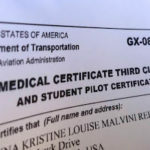 In fact, it led my flight instructor Stan to demand that I complete my short cross country flight the very next day. And so I did. Stay tuned!